With a cover like this, how could you not want to read it? The gargoyle along would have me ripping the book off the shelves just to see what it was about. 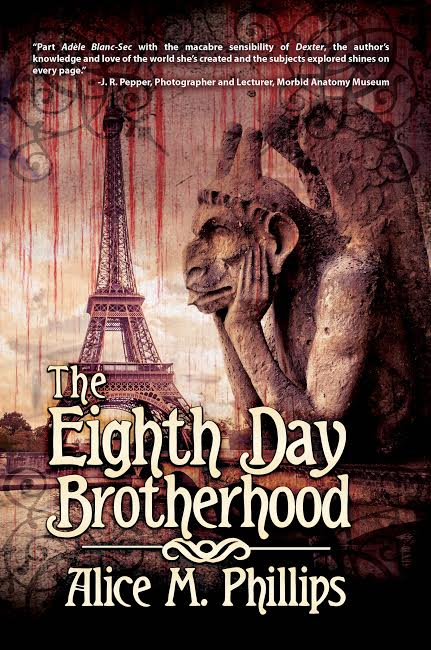 The Eighth Day Brotherhood is a beautifully written, dark tale, rich with atmospheric details of Paris in 1888, a time period I’ve always enjoyed reading about. This suspense-filled story may not be for the faint of heart, as the grisly murders are described in vivid detail, befitting for this type of novel. It’s obvious the author did her research in regards to the mythological references and Paris itself, as the descriptions made me feel as if I were walking the streets with the characters. This is a captivating historical thriller filled with references to history, art, and religion that pulled me in from the first page. I’d love to see more of these characters. I received a digital copy of this novel from the author.